Playing water polo in the still waters off Porto Cervo was an odd way to prepare for the winds to come. But no one had predicted the speed and severity of the conditions that would end the day, prematurely for some. The scheduled earlier start of 10 AM came and went without any sign of the wind that had been forecast yesterday. The Yacht Club Costa Smeralda Race Committee kept everyone ashore for an hour and a half, before heading out in the hope of finding the promised breeze. It came, eventually, at three o'clock. A gentle 10 knots from the north-northwest stirring a ripple in the calm. 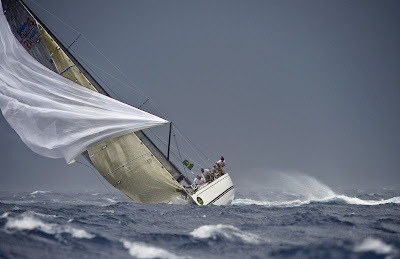 Nothing too special and certainly no great warning.The Swan Maxi Division started first and raced a 25 nm course that took them to a windward mark, before heading into the channel and a right turn north at Secca di Tre Monti off to the rocks at Monaci. Here they swung southeast for a fast reach down to Mortoriotto, where they turned back on themselves, upwind, to the finish off Porto Cervo.